According to MMAFighting, Mike Kyle has broken his hand and will be forced out of his April 9th fight against Gegard Mousasi. The light heavyweights were expected to meet at “Strikeforce: Diaz vs. Daley” inside the Valley View Casino Center in San Diego, California. Kyle owns a 18-8-1 professional record, but dropped his last bout to Antonio Silva this past December. The American Kickboxing Academy trained athlete broke his hand in that contest, as well. Mousasi has won two straight fights since losing the Strikeforce belt to Muhammed “King Mo” Lawal last August. It is unknown whether the company will keep the talented Armenian on the card or bench him for a later date. (UPDATED 2:30PM PT 3/31/11): Strikeforce CEO Scott Coker confirmed Kyle’s injury during today’s conference call. 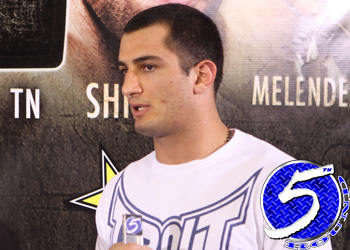 They will keep Mousasi on the card and intend on naming a replacement within the coming days.